The With One Voice (Uma só Voz, in Portuguese) choirs, formed by people with experience of homelessness in Rio de Janeiro are still going strong as this TV piece by TVT Network shows. The project, that started through the international Arts & Homelessness Network With One Voice 4 years ago, nurtures and develops the sector in Brazil, UK and a number of different countries, proving that the arts are a powerful tool for social change and the regain of self-esteem and dignity for people with experience of homelessness. “Music that brings joy. Music that brings out emotions. 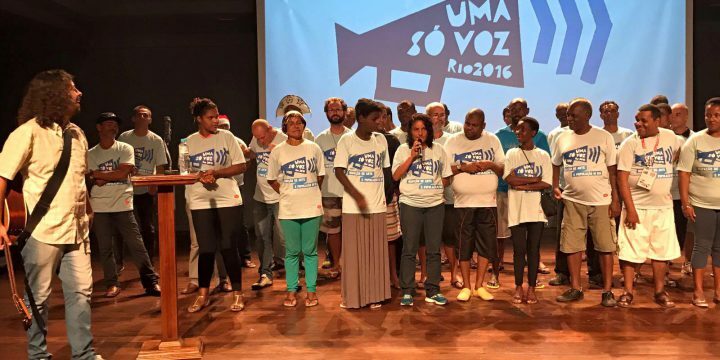 The project Uma só Voz, from Rio de Janeiro, brings together people that are or have been living rough to sing in choirs around the city. Since the beginning of 2016, there have been over 70 performances. “it’s been crazy, and now in December we’ve been doing practically 2 performances a day. It’s been really great, and it is a tool for social empowerment. We’ve been performing in places we (the people from the choirs) would never be able to have access to. And these people with experience of homelessness are getting into these places, presenting their art, being applauded. It is an incredibly empowering thing”. “Everybody respects each other, from the moment we get onstage, we have to have a posture, because from the moment you get on stage, everyone is looking at you”. ” Dignity is the word. Giving dignity to human beings. So this person is living as an invisible person and then they are invited to present art to people. They sing, dance, act and then are being applauded for it. Many of them say to me: “I’ve never been applauded before in my life”. We sing a song that expresses it very well. It’s a Beatles song that says” All you need is love”. And we say ” All WE need is love”, because all we need in this world is to love. “The eclectic setlist was performed in Zona Norte in Rio this week. These are voices united through the music that hopefully will spread throughout other places”.